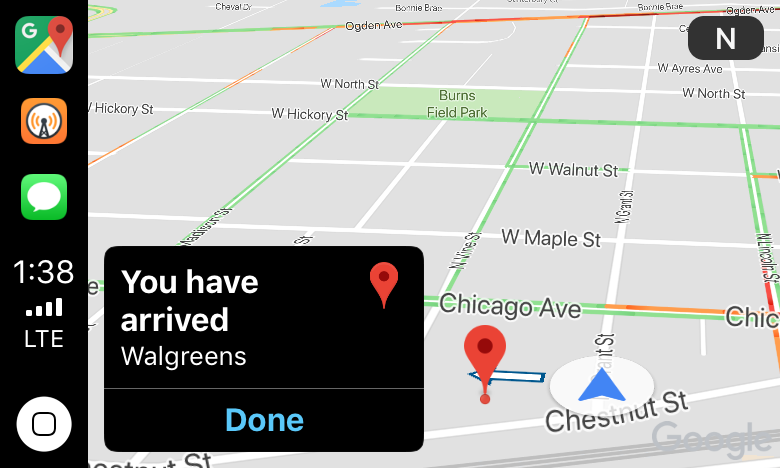 I just got home from a trip to my local drugstore using Google Maps’ new CarPlay integration. Once I had a destination selected and was on my way, the experience was fine, as long as I didn’t stray from the path. Overall though, from my very preliminary, single test drive, I wasn’t left wanting to switch away from Apple Maps. Google Maps (left) and Apple Maps (right). I like the interface of Google Maps better than Apple Maps. As you can see from the comparison screenshot above, Google’s app has a cleaner look and isometric viewpoint, which is used even when you are not traveling a route, compared to Apple’s more cluttered looking top-down view. To be fair, these two screenshots aren’t zoomed into the same scale, and with a couple of taps of Apple Maps’ plus button I would have had a similar scale that would show fewer streets and look less busy, but I still prefer Google’s look. Also, you can see that when I pulled over to the side of the road to take the screenshots, Apple Maps was confused about which direction I was going, while Google Maps was not. Navigation works as you’d expect. I’ll get into picking a destination below, but once you’ve found where you’re going, tap go, and Google Maps steps you through the route. There were two drawbacks to Google Maps’ CarPlay implementation compared to Apple’s. First, when I left the route suggested by Google Maps, I wasn’t redirected based on the change. Despite tracking my position, Google Maps seemed unaware of it relative to the route. In a second test, I deviated from the route suggested to a local pizza restaurant. I went the opposite way around the block from what the app suggested. Google Maps still told me when I had arrived at the restaurant, but it said ‘Your destination is on the left,’ which it wasn’t because I went around the block the opposite direction. Ways to pick a location in Google Maps. Second, Google Maps doesn’t have access to Siri, which has a dedicated Siri button on my Honda Accord’s steering wheel. You can still use voice search by tapping a microphone button in Google Maps’ UI, but the Siri button is far more convenient (and safer) when you’re driving. You can also pick a nearby destination from categories like gas stations and restaurants, retrieve a list of recent searches, or type in a custom destination, but typing on a CarPlay screen is not a good experience. When I left the route picked by Google Maps, it didn't reroute me. I’ll be sticking with Apple Maps which works well where I live. If, however, you live somewhere where Google Maps has better data and use CarPlay, check out the update. There are some rough edges compared to Apple Maps, but overall the design is solid, and it gets you where you are going if you stick to the route suggested. Google Maps is available as a free download on the App Store.